Bring long-necked wonder to your bookshelf with this charming set of silhouette bookends by Eric Gross. The journey between the covers of a good book can lead you through all kinds of unexpected places. This playful set of bookends from designer Eric Gross celebrates that spirit of adventure. 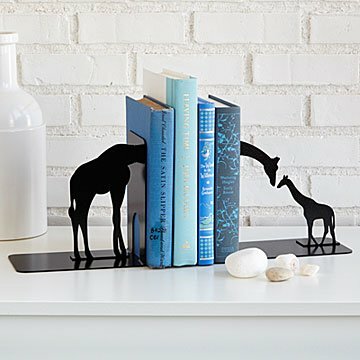 Hand cut from carbon steel, it captures the silhouette of a mother giraffe reaching out to nuzzle her baby with a neck that grows longer and longer with each book you're ready to digest. Handmade in Kentucky. We â�¤ï¸� our Giraffe Family Bookeneds! It's such a loving,tender design, Mama/ Papa Giraffe cherishing Baby Giraffe. Giraffe populations are dwindling, and need our help which make these bookends all the more poignant to me. It most definitely is a positive "uncommon good"
This was a perfect gift for my daughter and her husband. This was perfect for them as a reminder of the trip to Africa they had this year where they loved seeing the giraffes. Some review said this product had a strong paint odor, but we didn't experience that. Gave as a gift - She loved it! The perfect gift for yourself or anyone 9 - 90. Great selection of thoughtful, uncommon gifts. Very nice product. Great gift. I bought these bookends for my parents, who have very particular taste- and they both loved them! They are nice quality and don't take up much space. Perfect gift for dad who just remodeled his living room. These look great on his new book shelves and add an interesting visual element.